The province, as a whole, has about 600 kilometres of coastline, but the popular beaches in Durban are along the Golden Mile, which is actually about four miles (or 6.4 kilometres) long. The beaches are flat and sandy, with plenty of room for a stroll, sun-tanning or a game of volleyball. The waves are great for surfing, but safe for young and old to enjoy as well. Most of the beaches are protected by shark nets, as well as safety beacons and lifeguards. Durban and its beaches enjoy an average of 320 sunny days every year, which means that even South African winters do not hinder the appeal of the beaches in this gorgeous part of the world. Some of the beaches have been awarded Blue Flag status. This is an internationally-recognised status that translates to safe swimming beaches that undertake educational and conservation initiatives. This uplifts the community and guarantees a superior experience for those enjoying these beaches. The various beaches of Durban each offer something different. North Beach is favoured by body boarders, who love riding these waves and feeling the power of the water under their boards. South Beach is ideal for swimming as there are not dangerous rip tides and the waves are just right. For dedicated surfers, the Bay of Plenty and Dairy are a must. These are also good swimming beaches. For those that want to learn to surf on smaller waves, Addington Beach lies near the harbour entrance and is perfect for beginners. Of course, the beaches extend far further, characterising much of the province. Umhlanga Rocks is only 15 minutes outside of Durban and is all about fun in the South African sun. It is a busy, popular beach that is cosmopolitan. Bronze Beach is a quiet retreat, away from the madding crowds, giving an entirely different vibe and surrounded by many excelent choices for stay in Umhlanga. Further north, really scenic options include Kosi Bay, Cape Vidal and Sodwana Bay. Indulge in the beauty of the Durban beaches almost all year around. Remember that the sun’s rays are strong, and can cause damage to your skin. Wear a high-factor sunscreen and keep out of the sun during the hottest times of the day. Need more info? 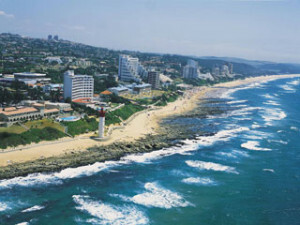 Find out more about Durban’s beaches from South African Tourism.